Pembroke Pines, FL – “I plan on majoring in environmental policy and one day working in veterinary medicine and public health,” says Somerset Academy Chapel Trail senior Anthony O’Neil. The Gates Millennium Scholar will be attending Harvard University in the fall. A first-generation college student from a low-income, mixed-Latino family, Anthony started at Somerset in the 5th grade. 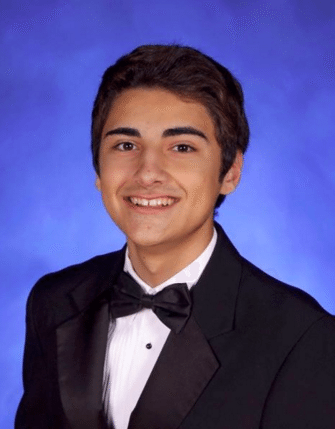 He was also named National Merit Finalist, National AP Scholar, and National Hispanic Scholar, and earned a Associate in Arts degree from Broward College while attending high school. “If it weren’t for you and Somerset’s incredible support, I wouldn’t be anywhere near where I am today. The opportunities that Somerset has given to me have officially turned the Ivy League dream into a reality for me…Thank you for always having an open door and being there for the students; it has truly made a difference for students such as myself…I hope to give back as much as I possibly can to our school community,” Antony said in letter to his princpal, Mr. Montero. Somerset Academy Chapel Trail is a k-12 public charter school located in Pembroke Pines (Broward County). The school — which includes a thriving Performing Arts program – is ranked among the Best in America by The Washington Post, US News & World Report, and Newsweek.